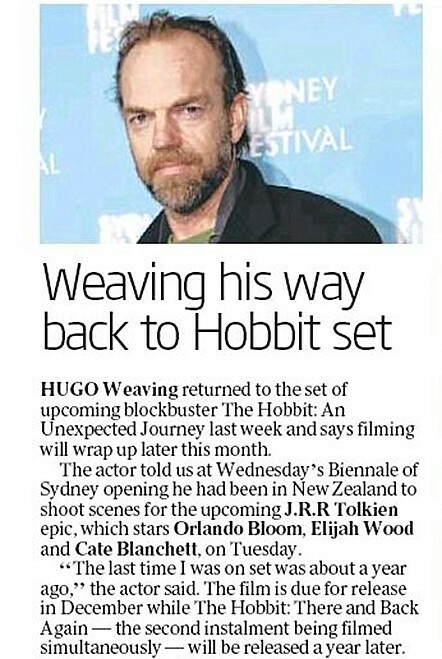 So apparently they just needed him for a couple of days, and Peter Jackson and co. are finally nearing completion on the mammoth film shoot, which has taken over a year. (It’s unlikely Hugo filmed any new scenes during the recent visit, as he’s kept his beard.) Hugo also took time to discuss Cloud Atlas with a different reporter recently; I’ll share links to that interview as soon as it’s online. On The Hobbit: “It was really lovely to see some old friends and old faces again, and to go back into a similar world, which is tonally a little bit different. …The project is so massive and there are so many people. It makes it frustrating for everyone because things just take time and you don’t know what’s happening. You don’t know what’s going on, despite all the best intentions, but the people are so lovely that you just accept, ‘Well, this is the way this particular world is.’ You live from day to day and from moment to moment, doing the best you can. There’s a delightful atmosphere there, so it was lovely. I’ve literally just come back from there a couple days ago, having done post-production on that, so it was really nice to see everyone again. You can see I have a hard time excerpting… so much good stuff in there, and Hugo doesn’t speak in glib soundbites. 😉 And he’s been more than generous with his time lately, despite having so many projects going at once. It always amuses me when websites say they have an “exclusive”… obviously Hugo has done several interviews this week, to the point where he’ll chat with reporters who run into him on his off time. 😉 But this is a wonderful piece, with intelligent questions asked and thoughtful replies given.